t our baptism, we are saved not only by Christ and with Christ, but also in Christ. Plunged into the waters of sanctification, we join Christ in His death and emerge in Christ's risen life. St. Paul says in his letter to the Romans: "By baptism we were buried with Him, and lay dead, in order that, as Christ was raised from the dead in the splendor of the Father, so also we might set our feet upon the new path of life" (6: 3-4). St. Paul describes baptism as putting on a new robe. "All you who have been baptized into Christ, have put on Christ" (Gal 3:27). This proclamation of our identity is sang on all the days when public baptism was received in the early church; Easter, Holy Saturday, Theophany, etc. In the early church, when most baptisms were performed on Holy Saturday, the newly baptized, wore their new, white robe for all the services during Easter week, hence we call this Bright Week. The white robe signifies the purity of soul that has been washed from sin. It also recalls the shining robe in which Christ appeared in the Transfiguration. There is now a likeness between Christ and the baptized; more than a likeness, the baptized has "put on Christ." St. Gregory of Nyssa states that the white robe worn after baptism symbolizes the garment of light which humans enjoyed before the Fall: "You have driven us out of paradise and called us back; You have taken away the fig leaves, that garment of our misery, and clothed us once more in glory." Our membership in the Body of Christ must be understood realistically. It is mystical, that is secret and invisible. We invisibly share in our Lord's nature, therefore it is a physical Body, though not material as ours are on this earth. St. Paul says: "For to me life is Christ...(Phil 1: 21)... Life eternal in Christ Jesus" (Rom 6: 23). You are in Christ Jesus by God's act, for God has made him our wisdom; he is our righteousness; in Him we are consecrated and set free (1 Cor 1: 30). Consider the boldness of these words from St. John Chrysostom: "We become Christ! The baptized Christian is not only born of God, but has put on Christ; and this not only morally, through charity, but in reality." St. Symeon the New Theologian, in his Divine Hymns of Love, writes: "We become Christ's limbs and members, and Christ becomes our members . . . Unworthy though I be, my hand and foot are Christ. I move my hand, and my hand is wholly Christ, for God's divinity is united inseparably to me." During World War II many churches in Europe were damaged by bombings. One particular church was completely destroyed except for a statue of Christ which was left standing. The statue was in very good condition, only the hands of Christ had broken off. After spending some time in prayer before the statue, an American soldier, impressed by the compassionate look in the eyes of Christ, hurriedly wrote a note and left it at the foot of the statue. It read: "He has no hands but ours." Did the soldier ever realize how very correct his theology was? he words, "God bless you," may be so familiar that they lose their power and significance. Yet to bless or be blessed has had a profound meaning from the time of Abraham to the present. Life is a blessing. Our baptism makes us a priestly people; we bless God by using the good things of our earth to glorify Him. All blessings bring back to God the gifts our loving Father has shared with us. Our Church abounds in blessings. During our liturgical year we bring various items to be blessed: water, flowers, fruits, candles, willows, herbs, Easter foods, etc. There are the blessings we receive during the Divine Liturgy, during baptisms, weddings, vespers, and funerals. All of these occasions for blessing are meaningful and important. There are other blessings that are equally powerful channels of God's love and presence: a letter from a friend on a gloomy Saturday, a bag of freshly baked cookies left on our desk with a note that says: "just for you," a surprise phone call on a lonely evening, a rose bud in our room, sunshine and robins chirping after a solid week of rain. However, there is still another kind of blessing, most neglected today ~ the blessing of oneself. Yes, we may reverently make the sign of the cross, or dip our fingers into the holy water font, but what about a different kind of blessing: blessing ourselves with an early morning walk to greet the sun, blessing ourselves with ten minutes of Beethoven during lunch break, blessing ourselves with a leisurely coffee break with good friends, or a day in the mountains, or in an art museum. These are authentic blessings because they provide us with an opportunity for an encounter with God. They open us to the reality, to the mystery, to the sacredness that lies within our deepest selves and stretches out to the boundaries of the universe. We need to bless ourselves not only with water that has been made holy, but with other commonplace gifts that carry the holy within them. Often we hesitate to bless ourselves with anything more than holy water because we feel undeserving. We wait for others to recognize our deservedness before we dare to accept anything, yet all we have is gift. None of us has blessed ourselves with life. God wants us to enjoy His creation, including ourselves! We need also to take another step to blessing ourselves ~ to reflect daily on the blessings that have been given to us in the goodness and kindness of others. We must remember that no one can be forced to love us ~ love is always a free and gracious gift. We will benefit greatly if we discipline ourselves to record in writing the blessings of each day. It is amazing how much comes to mind as we begin to recount the special encounters, the beauties and the love of each day. By reflecting back on the day in search of blessings, we become aware of our graced moments. Sometimes graces and blessings are wrapped in disguise. How often do we miss the blessing simply because we didn't recognize it as such. It is a good idea to keep a "Blessing Book" - a kind of diary in which we record the blessings which come to us each day. Such a book blesses us twice; the gift of the blessing itself and the recording of it. One of the ways we, who are robed in the garment of justice in baptism, can truly "put on Christ" is to become aware of all the blessings that are ours, and the blessing God calls us to be. Grandma told the story of some persons who wanted to buy $3.00 worth of God. They wanted just enough of God to equal a warm cup of milk or a comforting snooze in the sunshine, not enough to disturb their sleep or explode their soul. These people wanted ecstasy, not transformation. They didn't want to love their enemies or feed the hungry or pick helpless bodies from the street. They wanted the warmth of the womb, not a new birth. A pound of the Eternal in a paper sack ~ they wanted desperately to buy $3.00 worth of God. There are many Christians who want only $3.00 worth of God ~ no more, no less. Too much of anything is dangerous, they feel. "Three dollar worth will do." Put God in a sack so it is impossible for Him to crawl out and begin to mess into our lives or bother us with guilt feelings. They like the safe feeling of having God around, tight in a bag, or walled up in a church. $3.00 worth of God is enough. These Christians do not realize that God desires to share totally with each and all of us. Why settle for $3.00 worth? In the end, would you want to settle for only $3.00 worth of heaven? hrough the Eucharist we all become one in Christ since the same Christ comes to dwell in each of us. The Fathers of the Church take for granted the unity of the individual with God through the Eucharist. What they stress and emphasize greatly is the horizontal dimension of Communion ~ our becoming one with each other in Christ. "The very fact that we all share one bread makes us one body," says St. Paul. This means the same Christ who comes to us in holy Communion comes to us in the person of our neighbor, our fellow parishioner, our fellow Christian: Christ lives in every person I meet. "For as much as you did it unto one of these the least of my brethren, you did it to Me," says Jesus. The way I treat my neighbor is the way I treat Christ. To honor Christ in the sacrament of Communion and to dishonor Him in the person of my neighbor is sacrilege and hypocrisy. St. John Chrysostom writes: "Do you wish to honor the Body of Christ? Then do not look down or disdain Him when you see Him in rags. After having honored Him in church with silken vestments do not leave Him to die of cold outside for lack of clothing. For it is the same Jesus who says: "This is my Body," and who also says: "You saw me hungry and did not give Me to eat ~ What you have refused to the least of these my little ones, you have refused to Me! n old fable provides a wonderful insight into the Christian life our baptism challenges us to live. One day a traveler looked for a place to rest from the hot, burning desert sand he was crossing. He found a small clump of palm trees and rested in their shade. Gradually he became aware of a subtle fragrance. Searching, he discovered a small piece of clay and to his great surprise it was the source of the perfume. "You are a piece of clay," he marveled. "Tell me," he asked, " where did you get that rare perfume? It has the fragrance of a rose." "You are correct," the clay replied. "I am only a piece of common clay. There is nothing lovely about me. But, Sir, I was once part of a vase and I have held a rose." This is the Christian's beauty secret: dwelling with Jesus Christ, the Rose of Sharon (Song of Solomon 2: 1). No one can be unattractive or dull when they dwell in God's presence because the very life of God is kindled within them. And everyone can sense it! St. Paul wrote: "Christ uses us to reveal and spread abroad the fragrance of the knowledge of Himself! 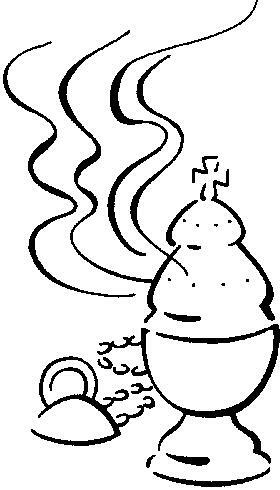 We are indeed the incense offered by Christ to God, both for those who are on the way to salvation and for those who are on the way to perdition: to the latter it is a deadly fume that kills, to the former a vital fragrance that brings life. Who is equal to such a calling" (2 Cor 2: 14-16)? A crushed rose produces a powerful fragrance. Jesus Christ poured out His life on the cross for our salvation, and offered the world the sweetest fragrance it has ever experienced. Again, St. Paul reminds us: "Christ loved you, and gave Himself up on your behalf as an offering and sacrifice whose fragrance is pleasing to God" (Eph 5: 2). This idea of a "fragrance pleasing to God," has been incorporated into the Divine Liturgy in the petitions prayed after the consecration. Our priest prays: "For the precious Gifts which have been offered and consecrated . . . that our loving God, Who has received them as a spiritual fragrance upon His holy, heavenly and mystical altar, may send down on us in return His divine grace and the gift of the Holy Spirit." St. Gregory of Nyssa wrote about those who became rivers of perfume in Christ: "The great Paul was such a river of perfumes flowing from the garden of the Church through the Spirit, whose streamlet was Christ's fragrance; and other such rivers were John and Luke, Matthew and Mark, and all the others, the noble plants in the garden of the bride, who were moved by that luminous southern wind to become sources of perfume, shedding forth the fragrance of the Gospels" (On the Song of Songs, Oration 10). Do we, robed in the garment of justice at our baptism, offer God a fragrant, pleasing life lived in union with Christ? Do we allow ourselves to become a river of perfume so that God's love may spread throughout our world?